Are you a fan of Lancome Bi-Facil Double-Action Eye Makeup Remover too? I love how easily it whisks away long-wearing foundation and waterproof mascara. But the price… ouch! Why can’t someone come up with a cheaper alternative? Oh, wait. L’Oreal did. 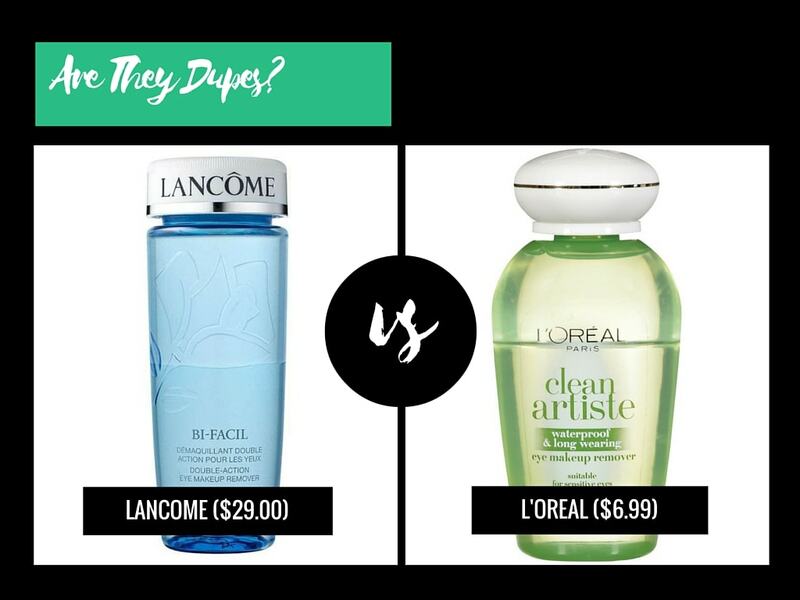 On paper, the Clean Artiste Waterproof & Long Wearing Eye Makeup Remover seems like the perfect dupe for Lancome Bi-Facil. But does it deliver? Isohexadecane is one of those useful ingredients nobody knows because it’s neither dangerous nor cool. It’s an iso-paraffin emollient with cleansing properties. That means it removes dirt and makeup, even the stubborn waterproof kind, quickly and easily, while leaving skin silky soft to the touch. Poloxamer 184 is another ingredient you probably never heard of. It’s a polymer that, like isohexadecane, cleanses skin gently. It helps water mix with oil and dirt, so they can be rinsed away. It leaves skin soft too. Its concentration is just a touch higher in Lancome Bi-Facil, which may make it slightly more effective than its L’Oreal dupe. What About The Rest Of The Formulas? Although Lancome Bi-Facil may cleanse skin that little bit better, L’Oreal is more hydrating. It contains isopropyl palmitate, an emollient that makes skin soft and smooth. The L’Oreal formula is also fragrance-free, so it’s more suitable for sensitive skin (and eyes). Water, Cyclopentasiloxane, Isohexadecane, Sodium Chloride, Poloxamer 184, Hexylene Glycol, Dipotassium Phosphate, Benzyl Alochol, Potassium Phosphate, Quaternium-15, Benzalkonium Chloride, Fragrance, Citronellol, Geraniol. So, is L’Oreal Paris Clean Artiste Waterproof & Long Wearing Eye Makeup Remover A Dupe For Lancôme BI-FACIL? L’Oreal Paris Clean Artiste Waterproof & Long Wearing Eye Makeup Remover is a close, although not exact, dupe for Lancome Bi-Facil. It’s only slightly less effective at removing makeup, but much gentler on the skin. It’s up to you to decide if the trade-off is worth the huge difference in price. Have you tried L’Oreal Paris Clean Artiste Waterproof & Long Wearing Eye Makeup Remover and/or Lancome Bi-Facil? What do you think of them? What Are The Best Skincare Products Under $10? Lancome Bi-Facil removes makeup so nicely except it leaves an oily residue but nothing toner can’t remove. For the amount of makeup I regularly wear: sunscreen, powders (cheeks), and some creams for highlight, mascara, shadow and liner, my DHC oil cleanser takes it mostly all off. Then I use Fresh’s Soy Face Cleanser to remove the rest. 😀 I always thought Lancome’s was ridiculously priced and so I’ve never purchased it. The one I have is a GWP during the holidays. Janessa, I agree. There’s no reason to spend so much for Lancome Bi-Facil when they are good and cheaper alternatives around. But it’s a nice one to try if you get the chance. I love the Sephora Favourites set, especially Give Me More Lip (you know I’m addicted to lip products lol) and Superstars. You get to try so many products without breaking the bank. I also like Too Faced Melted Kisses & Sweet Cheeks Collection. The shades are gorgeous! What about you? Lancome and L’Oréal are owned together like Gap, Banana Republic, and Old Navy. Forget which is the parent company.